SRH1440 Professional Open Back Headphones provide full-range audio with detailed highs and rich bass in a sleek, attractive design. Made for mastering and critical listening, the premium padded headband with steel frame offers hours of listening comfort. This is an exceptional pair of headphones. They are ideal for tracking and for checking your mix in headphone environments. So much contemporary listening is done on earbuds and headphones now, that it is advisable for engineers to consider what mixes spund like under headphones. 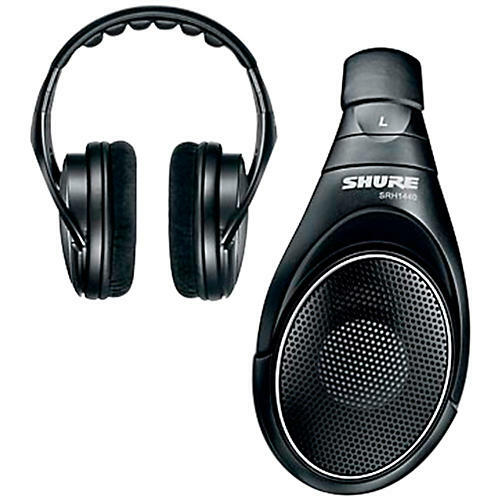 The Shure SRH1440s will clue you in to every nuance. The included storage case, replacement set of velour ear pads, replacement cable, and threaded adapter ensure years of uninterrupted listening enjoyment.